Even when we have low key holiday plans, the end of the year can bring its share of crazy. When I was single, and too far from my family to travel during the holidays, I often started my retail job at 5:00 am to help everyone else with their holiday stress. When I was an instructor, my students had their own special way to celebrate the holiday season (think; lack of focus, meltdowns, general chaos). This year, my end of year activities include assembling over 150 gift baskets for my husband’s company, including treats from our kitchen. (Hint, hint; please forgive the blog silence over the past week). So, I thought it was about time to introduce you to the organic in my tagline “organic to opulent style”. When I’m not reading or writing about fashion, I’m most likely doing the same for food and wellness. I focus as much on what I put into my body (if not more) as what I put on it. Obviously, this is not intended to be a substitute for medical advice, diagnosis or treatment. I am not a medical professional, but I have spent many years reading about healthy living, and have a few tips to share. At first glance, my top 7 tips sound a little crazy, so please continue until the end, and I promise it will all make sense. “What?” you say, “I can barely squeeze in breathing, how can I exercise more?” Well, during the rest of the year, you may have the time to get to the gym or take a class. When traffic increases and free time decreases, it’s more realistic to do smaller, more frequent workouts. I either run for 30 minutes or find a yoga class online. My favorite online yoga sequences are by Adriene Mishler and are free! If you don’t enjoy chocolate, skip this one. If, however, like me, you can’t live without it, the end of the year can bring a lot of temptation your way. Chocolate shows up at every party, monopolizes store displays and even sneaks into your gift bags. If you are tired, under stress, or too busy to eat real meals, it’s hard to resist. My solution? I indulge, in these cacao-maca bites. They are not low-calorie, but they hit the spot and give me a nice boost of energy when I need it. This smoothie has similar ingredients but is faster to make. It’s pretty common knowledge now that multitasking is inefficient, so I’m not suggesting that you paint your nails while writing a report for your boss. At this time of year, I try to simplify routines and use multi-tasking products. This foundation + moisturizer paraben free and nice to every day use. A wallet/clutch combo is an easy way to be party ready, especially when you carry it in your (everyday tote). I keep jewelry and hair accessories in my clutch. Often, I finish dressing up in the car as my husband drives to whatever party we are late for. For the record, he’s always punctual, and I’m always “fashionably late”. This year, I meant to buy these feather trimmed pumps, but since I just haven’t had time, I may add these to my stash of instant party upgrades. Every year, no matter how many lists I make, I forget someone or receive an unexpected invitation. So I have made a point to have more than I need in my gift pile. This blog post has some suggestions on extras to keep on hand, without being wasteful. The moms in my community are wonderful at sharing responsibilities to save time, or to help a friend in need. Everyone pitches in to cook and clean up at holiday parties. While one hosts a playdate, the other shops for both. Sharing (with the right person) can alleviate time and budget stress, so think about someone you can partner with on daunting tasks and gifts. Ironic that I end on this point, eh? 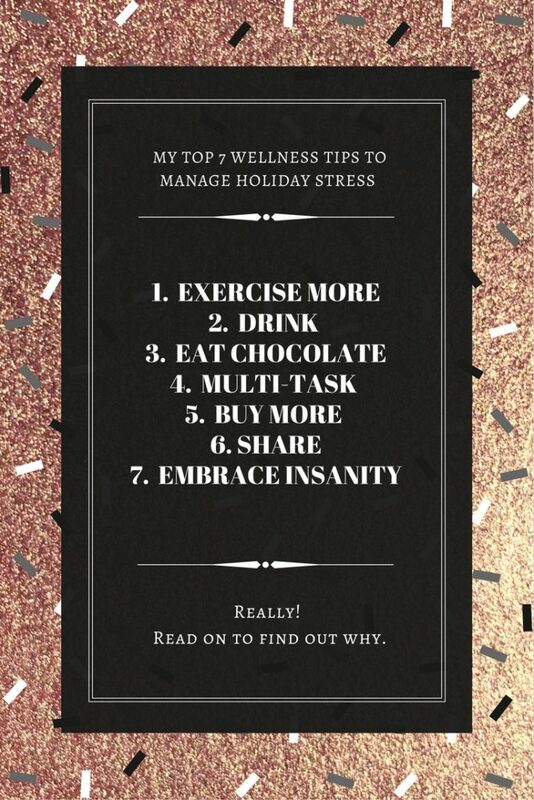 Seriously though, we are such experts at being stressed this days, that we can even be stressed about being stressed. Remember that this is a busier time of year, even if you aren’t a part of the holiday frenzy. Sometimes you can’t avoid letting something go, making a mistake, or gaining a pound or two. Don’t expect to be perfect. Then perhaps, that tip is the one you need the most?! Pingback: The Must Have Clutch of 2017/2018: the Box Clutch.